Intertwining ribbons of white gold encircle the face of this vintage bi-color mens wedding band. 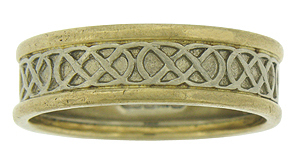 The edges of the wedding ring are fashioned of yellow gold. 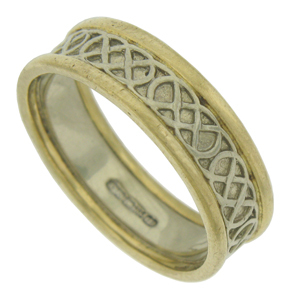 Crafted of 14K gold, the ring measures 6.69 mm in width. Size 10 1/2.